Dragon Towers ... will be directly linked to the Dragon Mart. Dragon Towers, a new twin-building residential complex, is expected to take shape in Dubai, following a contract award at the year-end. Master developer Nakheel is assessing five proposals, with bids starting at under Dh900 million ($245 million), for the construction of Dragon Towers, its twin-building residential complex at the rapidly-expanding Dragon City community in Dubai, UAE. Dragon Towers comprises 1,140 one- and two-bedroom apartments across two buildings directly linked to the Dragon Mart retail and trading hub. The complex will have two retail floors, four parking floors and a podium-level swimming pool, restaurant and gym. 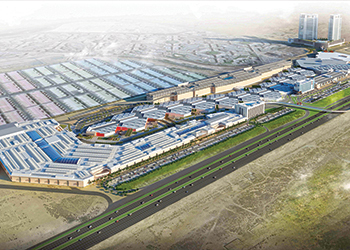 Nakheel expects to award the contract by the end of 2017, with construction scheduled for completion in 2020. Dragon Towers is a key element of Dragon City, Nakheel’s 11-million-sq-ft mixed-use master development, currently best known for Dragon Mart, the world’s largest Chinese trading hub outside mainland China. 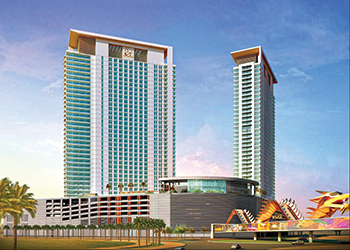 The Dragon City transformation began in 2012 with the construction of Dragon Mart 2, which opened in 2015, doubling the size of the original Dragon Mart to more than 3.5 million sq ft. Dragon City also includes two hotels – a 251-room ibis Styles that opened in February 2016 and a 304-room Premier Inn under construction – and a 375,000-sq-ft showroom complex and car-park, also under construction. Meanwhile, Nakheel continues to push ahead with the development of Deira Islands, its new, 15.3-sq-km waterfront city currently under construction in Dubai. It has recently awarded four contracts – collectively worth more than Dh430 million ($117 million) – covering islands A and B of the four-island development. The contracts are for a sewage treatment plant, a district cooling plant, a substation and piling work for an 800-room resort. Nakheel has now invested nearly Dh7.5 billion ($2 billion) in infrastructure and construction contracts for Deira Islands so far, with more expected shortly. • Dh14.5 million ($3.9 million) to Delta Foundations (Dubai branch) for piling works for the 800-room RIU beachfront resort, Nakheel’s joint venture hospitality project with Spain’s RIU Hotels and Resorts. A construction tender for the resort was issued in May, and is due to be awarded by the end of this year. With a diverse range of retail projects, resorts, hotels and residential developments, Deira Islands will transform Deira district into a world-class hub for tourism, retail and entertainment.